You’re hard pressed to enjoy London more than sipping cocktail on a glorious roof top or with a glass of rose on one of the many delightful terraces that spill over into the city streets after work. We have rounded up 10 of London’s finest establishments for you to choose from when the sun is shining. buckets of beer; barbecue platters; Pimm’s and pink champagne can all sipped to the beat of some of London’s favourit DJ’s the the effortless cool Toy Roof. Perched high above effervescent and bohemian Soho, is the roof bar of the Corthouse hotel. A perfect place to withdraw from the hubbub of London’s lively West End, the Toy Roof does exactly what it says on its shiny tin: the pristine, whitewashed terrace with its wicker chairs and graffiti murals exudes a laidback ambience where you can soak up the rays by day, and gaze at the stars by night, sipping on cocktails so dang playful you’ll find drinks like the Tiramisu, fresh Watermelon Martinis, and even one which contains avocado. A new rooftop music venue and bar is due to launch on Oxford Street this summer.The Gardening Society at John Lewis Oxford Street will entertain music lovers from across the capital with their upcoming Summer of Sound On The Roof series.The remodelled space above the John Lewis store on 300 Oxford St will welcome live shows, DJ sets and acoustic performances from May 5.The setting features immersive studio spaces curated by the likes of audio experts Sonos, Ruark Audio and Naim. The space will also feature refreshments from Fever-Tree’s Gin & Tonic Garden, as well as fried chicken specialists Butchies and drink selections from Background Bars. Dalloway Terrace has been transformed once again this spring with a bee-inspired interior to highlight the importance of bees. The terrace has been reimagined by master florist Nikki Tibbles Wild at Heart, and is adorned with an abundance of wild English flowers creating a kaleidoscope of colour, with oversized bees laced within the blossom. A new Honey Bee-themed afternoon tea is available alongside a new seasonal menu by Executive Head Chef Byron Moussouris. 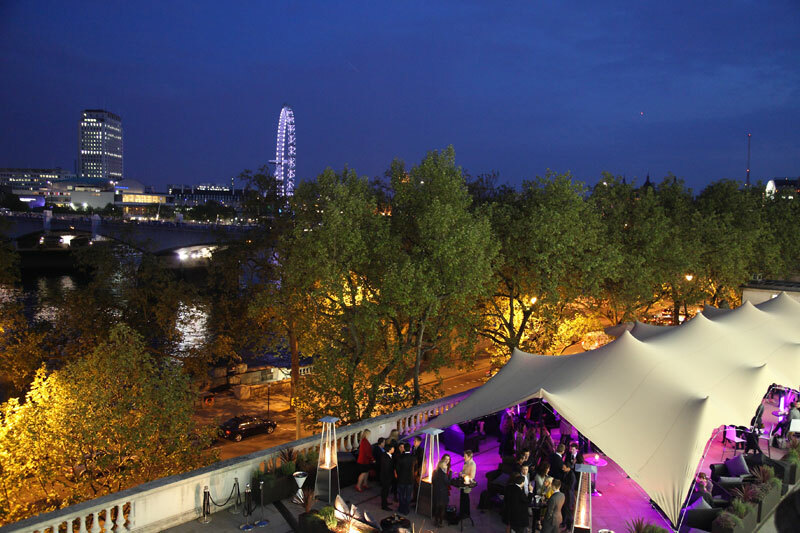 Coppa Club’s famous riverside igloos are out, and tropical new Paradise Pods are in. Each super-Instagrammable pod will be kitted out with palm trees and hanging lanterns, forming part of a tropical beach resort with an outdoor bar that you enter via a bamboo walkway. The pods, which offer knock-out views of London’s iconic Tower Bridge, HMS Belfast and The Shard, are open for breakfast, lunch and dinner, and are perfect for a lazy weekend brunch. The sunny rooftop at contemporary Spanish restaurant aqua nueva provides a great escape from the marauding crowds of Regents Street and Oxford Circus. They like a cheeky collaboration here, too. Last year they partnered with Cîroc Vodka to create aqua nueva’s Formentera Terrace, bringing the island’s relaxed vibe to the rooftop to channel the blissed out Balearics with greenery and floral displays. We are anticipating this summer to be just as exciting. When the sun comes out, Londoners take to the parks. The Serpentine Bar and Kitchen is in the middle of Hyde Park, right next to the Serpentine Lake and the views are spectacular. Not only does it offer clear views the swans and boats, but it is also a great spot for people watching – picnic makers, rollerbladers and dog walkers alike. There’s a Gin Bar, great cocktails a hot dog BBQ, a wood fire pizza oven and a whole range of British classics to tuck into. One of the coolest restaurants in town, SushiSamba offers a unique blend of Japanese, Brazilian and Peruvian cuisine, music and design. Located on the 38th and 39th floors of the Heron Tower, it has one of the highest outdoor dining terraces in Europe, offering unparalleled 360-degree views of the City. The indoor-outdoor elements featured throughout the space, most notably, the designed structural orange tree on the west terrace. Last year it was Il Tetto Restaurant & Bar at Selfridges’ Roof Deck, and this year it’ll be alto by San Carlo, bringing their world-renowned Italian style to the roof. The eagerly anticipated alto by San Carlo will offer a day-to-night menu of seasonal Italian dishes made using only the finest ingredients. Expect spectacular seafood and an expertly curated wine list in a stunning Italian garden setting. If you just fancy a drink, check out the Selfridges Peroni Ambra Roof Terrace. Enter via the express lift in Fragrance on G.
ONE STREET, FOUR RESTAURANTS, THREE BARS AND A SUMMER ENGLISH GARDEN, never before has an entire street been transformed into an epicurean avenue dedicated to some of London’s most exciting food, drink and social experiences, until NOW… There’s no better place to while away a warm spring/summers day or night ~ eat, drink and party with us in London’s largest pub garden. Pergola Paddington returns as a sunny summery paradise – a secret hideaway in the heart of West London’s busiest business district. Adorned with heavy green foliage, set against the backdrop of Paddington’s urban surrounds, the two floors of this vibrant space will be carefully curated for summer, creating a botanical alfresco dining destination . Open Wednesday to Sunday, lounge around on one of their giant day beds, sip on bespoke cocktails or eat from one of the best independent eateries. This summer, the food line-up will see the return of burger legends Patty & Bun and Mexican fast food specialists DF Mexico, as well as new additions including shredded duck restaurant Canard and Vietnamese barbecue masters MAM. Open from 26 April 2018 until 1 October 2018. Immersing guests in London’s ultimate beach club concept. Escape to London’s beach club paradise, Fulham Beach Club transports guests to distant shores with its stylish indoor/outdoor Thameside beach venue. Enjoy lounging on day beds with a group of friends, book your own beach hut, or reserve your exclusive cabana on the beach! Choose from two bars, Jimmy Garcia’s BBQ Club pop-up restaurant, Pineapple Pizza and chill with live Dj’s plus a variety of weekly events, to . Games include Shuffleboard, Ping Pong, Beer Pong & Croquet for those more competitive spirits! Step out of the lift onto the top floor of One New Change into the world of Madison. With several rooftop terraces offering supreme views across the City of London skyline, the space can be enjoyed year round with our umbrellas and heaters. The Bar at Madison is a destination in its own right with spectacular city views, a wide range of cocktails and delicious bar snacks. Frank’s Café is the hottest spot south of the river come summer. Coming back for Summer 2018, its the country’s coolest multi-storey car park with cocktails (make it a Negroni or Aperol Spritz) and excellent sharing plates like buffalo chicken wings with blue cheese crème fraiche and smoked paprika and parmesan-roasted corn on the cob. The whole of Shoreditch tends to descend on this place so the bar queue is usually huge. Pop Brixton has shed its winter roof ready for the summer season. South London’s go-to alfresco drinking and dining destination has an ever-growing selection of street food vendors and bars serving everything from gyoza to jerk chicken, the venue is perfect to while away the summertime. Look out for special events, from yoga brunches to vintage kilo sales, film clubs, family discos and big music nights. The Lido Café in Brockwell Park is one of our favourite spots in south London when the sun is out. A good-sized terrace faces the swimmers and the park’s leafy trees beyond, transporting you away from London and into a more rural environment. Modern-British food is served all-day, making this a great spot for breakfast, lunch or dinner. Described as an ‘urban utopian oasis’ with views of the London skyline, we are excited for its re-opening this summer. Membership for the season is £5, which grants you unlimited entry into the Roof Park’s events – film screenings, music, street food and more. Its Facebook page will keep you up to date with what it’s got planned. Last summer, Boisdale of Canary Wharf transformed its popular outdoor space into a 130-metre Jamaica Garden Terrace. Sponsored by the Jamaica Tourist Board and Grace Foods, the Boisdale Jamaica Garden Terrace was decked out as rain-forest fringed shores of the famous parish of Portland, Jamaica, with lush tropical plants and cascading palm trees. Imbibe the Jamaican rum punch was specially created for the occasion by Boisdale. The Jamaica Garden Terrace was also home to a rich, tasty selection of meats from the Jamaican Jerk BBQ grill including pork, chicken and specials such as lobster and shrimp. Stratford is cool now. The Olympics have packed up and moved on, the sporting legacy is questionable, but the canals and outdoor spaces speak for themselves. Pitch on Bridge Terrace off Stratford High Street has just opened ready for the Easter weekend, offering some of London’s best street food (gourmet hot dogs, souvlaki, Venezuelan food, vegan dishes), colourful, design-led (and weather-proofed!) spaces to hang out in, a craft-focused bar, Sunday DJ brunches, plus a schedule of activities and events from themed outdoor film screenings to evening classes and party nights. It’ll be a great spot to watch the World Cup, too. Open from Fri-Sun in April, Thu-Sun in May and every day in June and July. Open till autumn. Savage Garden is a new dramatic sky-high destination bar opening in the City in June. Sitting 12 storeys above the city below, the all-day bar and cocktail lounge, located atop the DoubleTree by Hilton Hotel London – Tower of London, boasts 360-degree views over the City of London, taking in The Shard, Tower of London, The Gherkin and St Paul’s Cathedral. Inside, the interiors are brutal yet sultry with savaged surfaces contrasting with plush velvet finishes. Outside, a large all-weather north-facing terrace is set-up for all seasons, from lunching alfresco and sundowner cocktails in the summer to hot toddies and fireworks come autumn, courtesy of Savage Garden’s retractable roof. A second south gin terrace is the perfect place to while away warmer days. Hard liquor meets savage tinctures in captivating cocktails, as well as a menu of small plates for lunch and dinner.